This flash diffuser is an essential piece of kit that any level of the photographer should own. The diffuser box fits snugly on to the compatible flash unit without the use of fastenings and simply diffuses the light output of the flash, producing softer shadows. This fantastic little diffuser attaches to the front of your Flashgun, giving a diffused light from your flash gun, cutting down and softening harsh shadows in your photo. Made from strong lightweight material the diffuser is pure white on one side and silver on the reverse with a wide elasticated strip on either side it fits over the back of the flash head creating an evenly diffused light source. 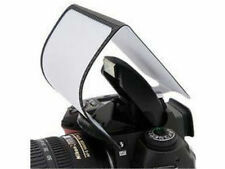 1 x Universal Pop-Up Soft Screen Diffuser. It mounts onto the hot shoe slot and diffuses the light emitted from the flash. Light weight and easy carry. It disperses the light over a wider area for a softer, more balanced and natural effect whilst avoiding harsh shadows. Made from strong lightweight nylon fabric with an elasticated mouth it fits over the flash head creating an evenly diffused light source. The diffuser will fit almost all flash models. The flash with our diffuser installed and tilted at 45 degrees gives a nice soft wrap around of light with a soft shadow behind the subject. 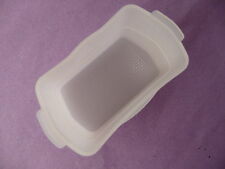 1 x Universal Hard Screen Pop-Up Diffuser. It mounts onto the hot shoe slot and diffuses the light emitted from the flash. Light weight and easy carry. It disperses the light over a wider area for a softer, more balanced and natural effect whilst avoiding harsh shadows. For Canon Speedlite 580EX/580EX(II) Flash. Ultra-Wide Angle of Coverage. Diffuses Light from Shoe-Mount Flash. model:580 EX/ 580 EX II. Best Quality. 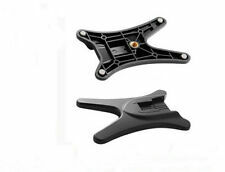 Flash Flip Bracket Grip for Canon 270 EX EXII 320 EX 430 EX II 580 EX II. Lightweight, compact flash bracket with rotating flash arm. The bracket is made of Aluminium and has a non slip sponge hand grip. DUAL SHOE FLASH BRACKET GRIP FOR ROLLIEFLEX 2.8 3.5 Yashica Mat 124G. D90 D100 D200 D300 D700 D2X D2Xs. Loosen the clamping screw shoe, slide flash into mount and tighten snugly. SHOOT BETTER PICTURES WITH MORE PROFESSIONAL RESULTS! BRACKET FEATURES. This cable has a 3' heavy-duty coiled cord and features a shoe mount on the bottom of the flash connection shoe, as well as a 1/4"-20 socket. 1x Flash Diffuser Softbox. Perfect compatible for your Speedlite. For Canon Speedlite 580EX/580EX II. This flash diffuser is an essential piece of kit that any level of the photographer should own. The diffuser box fits snugly on to the compatible flash unit without the use of fastenings and simply diffuses the light output of the flash, producing softer shadows. FLASH GUN STAND. 1x Hot Shoe Flash Base Stand. For Nikon Speedlite SB-600/SB-800 Speedlite. Perfect compatible for your Speedlite. This flash diffuser is an essential piece of kit that any level of the photographer should own. The diffuser box fits snugly on to the compatible flash unit without the use of fastenings and simply diffuses the light output of the flash, producing softer shadows. Perfect compatible for your Speedlite. Compatibility: for Nikon SB-600/SB-800 Speedlite. This flash diffuser is an essential piece of kit that any level of the photographer should own. The diffuser box fits snugly on to the compatible flash unit without the use of fastenings and simply diffuses the light output of the flash, producing softer shadows. For Canon Speedlite 600EX 600EX-RT Speedlite. Perfect compatible for your Speedlite. This flash diffuser is an essential piece of kit that any level of the photographer should own. The diffuser box fits snugly on to the compatible flash unit without the use of fastenings and simply diffuses the light output of the flash, producing softer shadows. 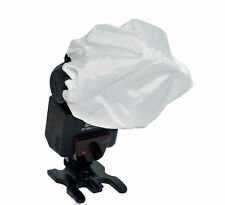 Asimple yet effective mini beauty dish is perfect for speedlites. All components of the kit are simple to build and fantastic for all your lighting needs. Allowing you to modify your light however you like to create stunning images. Advance features — Such as modeling flash,TTL flash are not included. Reflection flash—Can reduce the shadow behind the body was taken to achieve more naturally photography effect. Type: Airborne flash. Has a 1/4" threaded socket so you can mount a flash on a tripod or light stand. Nice, all machined parts. Canon SpeedLite 580EX II, 580EX, 550EX, 540EZ, 520EZ, 430EX, 430EZ, 420EX, 420EZ, 380EX;. With the built-in umbrella holder at the base, you can have portable studio lighting without the hassle. This product is easy to put on the stand and holds tight. For Sony F42AM Speedlite. Perfect compatible for your Speedlite. This flash diffuser is an essential piece of kit that any level of the photographer should own. The diffuser box fits snugly on to the compatible flash unit without the use of fastenings and simply diffuses the light output of the flash, producing softer shadows. Rotating flash arm for vertical shots reduces background shadows. Flash Mount: Canon 580EX. Flash Diffuser with 2 Color Temperature Filters, Plastic. Robust rectangular lip makes the installation easy and stabilizes the shape. Softens harsh shadows and contrasts of ordinary flash photography. 3 diffusers to soften, warm and cool light. Release built in flash and mount the diffusser to match the height of the flash lens. 1 x set of 3 colour diffusers with hot shoe mount. Eliminates the annoying red eye effect Instruction. 12" 30cm PC connectors Sync Male to Male Lead Cable Cord. Standard PC (Prontor Compur) Male-to-Male fittings (with central pin). We hope you can give us a chance to improve our service and resolve problem for you. The Pixel TF-322 contains a Nikon hotshoe connection on the top and bottom of the adapter and supports I-TTL. 1 x Pixel I-TTL Hotshoe Adapter TF-322 for Nikon. Box Contains. For Sony Speedlite F58AM. 1x Flash Diffuser Softbox. Perfect compatible for your Speedlite. This flash diffuser is an essential piece of kit that any level of the photographer should own. The diffuser box fits snugly on to the compatible flash unit without the use of fastenings and simply diffuses the light output of the flash, producing softer shadows. For SonyF58AM Speedlite. Perfect compatible for your Speedlite. This flash diffuser is an essential piece of kit that any level of the photographer should own. The diffuser box fits snugly on to the compatible flash unit without the use of fastenings and simply diffuses the light output of the flash, producing softer shadows. Display: Yes. Light Source: Xenon. Model Number: JYC-680A. Spring clamp opens up to 2" wide. Double jointed Ball-head can also be attached to the spring clamp handle for further versatility (w/rubber sleeve removed). Heavy Duty Clamp Mount. Rubber sleeve allows the clamp to be firmly gripped. 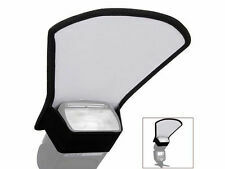 1x Flash Diffuser Softbox. Perfect compatible for your Speedlite. For Nikon Speedlite SB-900/SB-910. This flash diffuser is an essential piece of kit that any level of the photographer should own. The diffuser box fits snugly on to the compatible flash unit without the use of fastenings and simply diffuses the light output of the flash, producing softer shadows. For Nikon Speedlite SB-900/SB-910 Speedlite. Perfect compatible for your Speedlite. This flash diffuser is an essential piece of kit that any level of the photographer should own. The diffuser box fits snugly on to the compatible flash unit without the use of fastenings and simply diffuses the light output of the flash, producing softer shadows. 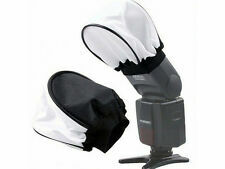 Specially designed to use with Speedlite, it makes photographers to bring their studio everywhere they travel. Shooting an object directly by the flash gun will make the light and shadow look too rigid. For Canon Speedlite 600EX 600EX-RT Speedlite. 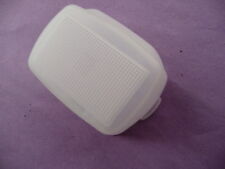 1 X Flash Bounce Withe Diffuser light box. Perfect compatible for your Speedlite. This flash diffuser is an essential piece of kit that any level of the photographer should own. Enlarge and spread the light with the flash in the direct flash position. The flash with our diffuser installed and tilted at 45 degrees gives a nice soft wrap around of light with a soft shadow behind the subject. For Sony F58AM Speedlite. Perfect compatible for your Speedlite. This flash diffuser is an essential piece of kit that any level of the photographer should own. The diffuser box fits snugly on to the compatible flash unit without the use of fastenings and simply diffuses the light output of the flash, producing softer shadows. Universal Accessory Holder:New. This is a cold shoe for Nikon flashes with the locking lever/pin. It has a female 1/4" threaded socket on the bottom so you can mount it on a light stand stud or tripod. Seagull SYK-4 optical slave trigger with built-in tripod socket is designed to work with portable flash units that have standard hot shoe mount. It can be triggered either by slave sensor or by using PC connector. Create Center to highlight ， edge and excessive soft shadows. The light can be much concentrated and precise when applied on the flash gun.